There’s a new man in my life. These past several months while The Professor lay sleeping beside me, I’ve been snuggled up with Thomas Keller – well not literally, but I have been snuggled up with his latest book, Bouchon. I’ve never had the pleasure of enjoying a meal at any of Chef Keller’s famous restaurants nor have I purchased any of his packaged bakery products – but I’ve watched via social media, friends living on both coasts waxing poetic about both the food and the pastries offered at any of Chef Keller’s establishments. And when Bouchon was released last fall, I knew I wanted a copy but would I be able to bake from it? As a non-pastry-school-trained, gluten-free home cook, really bake from it? And as someone who is really, really, really bad at math – be able to convert regular formulas into gluten-free formulas? Turns out the answer is yes. But it hasn’t been without challenges and a multitude of failures – I’ve lost count at how many loaves (if you can call them that) of bread and rolls I’ve tossed over the past three months; we’ve talked with other gluten-free bakers and recipe developers and we’ve poured over recipes in books and on the internet. The Professor made spreadsheets of gluten-free flours, combinations and methods; some were downright failures, others were just ‘meh’ and still others were good, but not great. I’ll be posting another bread recipe in the next week or so about this whole process but in the meantime here is a recipe for Hot Cross Buns that we really love. Soft and tender, speckled with plump, vanilla-laced fruit and dressed in a cinnamon-cardamom icing, these gluten-free buns have the perfect balance of sweetness – Chef Keller uses the word ‘beguiling’ to describe them and he’s exactly right. The buns are made with a gluten-free brioche dough – enriched with butter and eggs so if you need to be dairy-free, this isn’t the recipe for you; additionally, you need to allow the mixed dough to proof overnight in the refrigerator, so plan accordingly. And one more thing – don’t save these gems just for the Easter holiday – they really are quite lovely so make them more than once a year! NOTE: Most measurements are given by weight as I have found this results in the best performance of a recipe; make sure all your ingredients are room temperature to ensure even blending. Place currents and cranberries in a medium bowl and pour 2 cups of boiling water over them; allow to set for 5 minutes to plump. Drain and pat dry; wipe out the bowl, add plumped fruit and the vanilla paste. Stir and set aside. In a glass measuring cup place warmed water, sugar and yeast; mix gently and set aside to allow the yeast to ‘proof’ – usually 7-10 minutes is sufficient. In the bowl of a stand mixer fitted with paddle, add AP gluten-free flour mix, oat flour, xanthan gum, psyllium husk, flax seed, chia seed, if using (SEE NOTE ABOVE) and kosher salt; give it a few whisks to distribute all dry ingredients. Add eggs, egg yolks and honey to yeast mixture and whisk slightly; turn mixer on low and slowly add yeast mixture. Cut softened butter into 6 or 7 pieces and add one piece at a time until all has been added. Set mixer to medium and mix for 8 minutes; return to low speed, add the fruit and mix for another 2 minutes. The dough will look like a very thick cake batter – it will not look like a regular yeasted dough and is exactly what you want. Lightly spray a large bowl with cooking spray, scrape the batter into the bowl, place a piece of plastic wrap directly onto the dough batter and set into a proofing box or in a warm, draft-free area for an hour. After an hour, remove the plastic wrap and with a spatula, turn the dough onto itself, place the plastic wrap back onto the dough, then completely seal the entire bowl and place into the refrigerator overnight. Spray a half-sheet pan with cooking spray; line with parchment and spray lightly again. Set aside. Remove the dough from the refrigerator and it should now feel more like regular dough – it should be slightly sticky but again, exactly what you want. Place a bowl of water on the counter (large enough to dip one hand in) and, with damp hands, divide the dough equally into 12-15 pieces (approx 90-100 grams each), rolling each piece into a smooth ball. You’ll need to re-dampen hands as you go. Work quickly as the dough softens more as it warms and comes to room temperature. Gently, brush tops with a light coating of egg wash; loosely cover with plastic wrap and allow to proof for 2 to 2-1/2 hours depending on room temperature, etc. Preheat oven to 350 degrees; brush the tops with egg wash again and bake for 25-30 minutes or until the tops are golden and a toothpick inserted comes out clean. Cool completely. In the bowl of a stand mixer fitted with the paddle, add powdered sugar, cinnamon and cardamom – whisk to blend; with the mixer on low, slowly add milk and mix until blended – you can add more milk if needed but you’re looking for a fairly thick consistency that allows you to pipe icing from a piping bag. Place icing in a disposable piping bag cut off ¼-inch tip and starting at the left side of the top corner bun, pipe a continuous strip of icing across the tray of buns; repeat with remaining rows. Repeat in the opposite direction. Serve immediately as these are best the day they are baked. You can make the dough, roll into balls, freeze on a sheet pan, wrap tightly with plastic wrap and stored up to a week; just keep in mind that it may take as long a 5 hours to proof the dough. 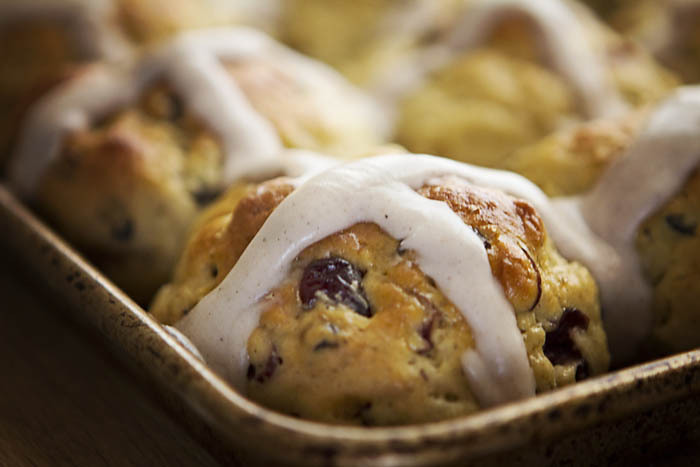 These look amazing… totally perfect way to start the morning. I adore Thomas Keller’s books, and find that I learn something every time I turn to a new page. 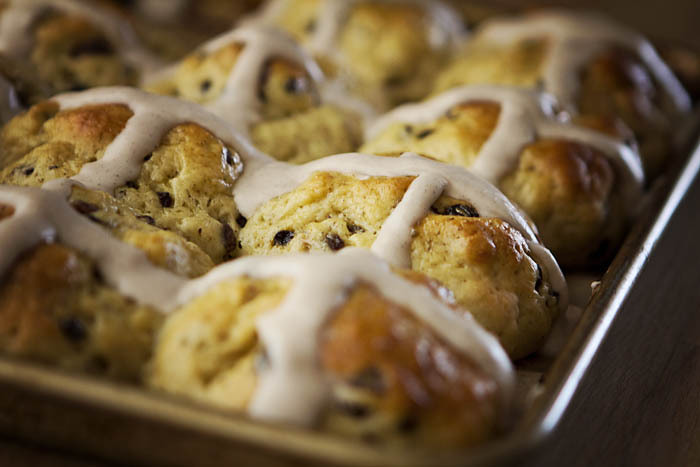 Hot cross buns are a staple at our house on Easter morning. How fantastic that you found a way to turn these gluten-free! These are so, so gorgeous, Deb! I know they taste fabulous, too! YUM! Lovely! I neeeeeed to get that book. And soon.